In the aftermath of the 2008 financial crisis, many central banks have engaged in quantitative easing (QE) by buying massive amounts of bonds and other securities from market participants in order to provide liquidity to the markets, reduce the cost of capital, and ultimately foster economic growth. Although such monetary policy measures seem to have had the desired effects in the domestic economy, there are still many open questions about the global impact of QE (and its subsequent unwinding) on the stability of financial markets and financial institutions, not only in industrialized countries but also in emerging markets. On 2 and 3 April, academics, practitioners, and policy-makers came together at the House of Finance for the “6th International Conference on Sovereign Bond Markets: Quantitative Easing and Financial (In)Stability” to discuss these questions. Overall, nine theoretical and empirical papers on the interactions of financial intermediation and sovereign debt markets were presented at the event. On 2 April, Loriana Pelizzon from SAFE/Goethe University and member of the Scientific Committee of the conference welcomed all participants. She stressed that QE affects many aspects of the daily lives of people. Because of that, it is worthwhile to understand the impact of QE better, she said. 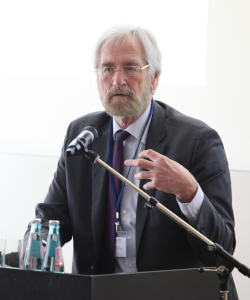 Peter Praet, Member of the Executive Board of the European Central Bank, gave some opening remarks. He emphasized that it is difficult to assess the impact of QE because the program started in dysfunctional markets. In addition, it is very difficult to isolate the effect of one instrument of monetary policy because they are intertwined, he said. Similarly, the markets such as the US, Europe or Asia are highly connected. With spillover-effects of one market to another, it is hard to tell what the specific contribution of one instrument is, he said. On 3 April, Jutta Dönges, Member of the Executive Board of the German Finance Agency gave a keynote speech. A panel discussion moderated by Marti Subrahmanyam from New York University concluded the conference. On the panel, Christian Wellner (Head of the Strategy Division, German Finance Agency), Guido Galassi (Product Manager Cash Markets and Head of Data, MTS Markets), Giuseppe Maraffino (Fixed Income Strategist, Director at Barclays Capital), and Karsten Stroborn (Head of the Monetary Implementation Division of the Market Operations Group, Deutsche Bundesbank) discussed the topics of the conference. The event was organized by the Research Center SAFE. Co-organizers included NYU – Salomon Center, University of Michigan – Mitsui Life Financial Research Center, the Asian Bureau of Finance and Economic Research (ABFER), Waseda University, the National University of Singapore, Business School – Centre for Asset Management Research and Investments, the Bank of Canada, Deutsche Bundesbank and the European Central Bank.